Johnny Shines CDs available from Document Records. 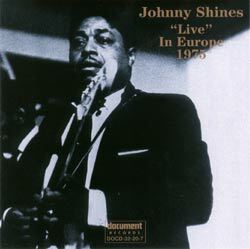 Johnny Shines Live In Europe 1975. Click here to go straight to the CD. The snow is falling, the temperature is only just above zero, and a native of the American Deep South is a long, long way from home. Johnny Shines was, in the 1970`s, resident in Holt, Alabama, not far from the city of Tuscaloosa, but often away on tour in the United States and overseas. He was now experiencing the "fairyland" of an Austrian Winter (February 1975), the farthest point east of a European tour, with a series of great performances at the `Jazzland` club in Vienna. John Ned Shines Jnr. was born April 1915 in Frayser, Tennessee, then a small farming community 5 miles from Memphis, now a suburb of the expanding city. Johnny recalled that they had full stomachs (often not the case in later years), a pleasant environment and heard alot of church music. But the idyll wasn`t to continue as his parents were feuding in December, 1921 and moved (separatly) to Memphis and the six year old Johnny was shuttled back and forth between them or lived with other family members. For a time he experienced the life and colour of Beale Street when his parents lived there together before John Snr.`s alcoholism resulted in final separation and divorce. Johnny`s mother, Virnether Frazier, remarried in 1925 and moved to Arkansas. John went with them but never got on with his stepfather and around 1929 headed back to Frayser to stay with an uncle. Strong for his age , he did hard manual labour in the cotton fields (but loathed it), in a sawmill and later, as a willow driver. In 1930 he was back with his alcoholic father, sharecropping in Mound City, Arkansas. Here he became increasingly taken with the music of the local barrelhouse pianists and first encountered Walter Horton, who - some years later - became his friend and musical partner. Returning to Memphis, Johnny again stayed with his maternal uncle Van Frazier, spending time and singing with his guitar playing cousins. A few months later he reconnected with his mother in Hughes and from his brother Willie learn`t the rudiments of playing guitar. Inspired with an encounter with Howlin` Wolf (Chester Burnett), who was singing and playing on the streets in Hughes, he became known locally as "Little Wolf" and picked up several of the big man`s pieces, as well as the ballad "Jim String", Memphis Minnie`s "Bumble Bee" and Hambone Willie Newborn`s "Roll and Tumble Blues". For several years he took work tending cattle, guarding them against wolves and rustlers. A series of back breaking jobs followed and he increasingly found solace from the hard labour by spending time in Memphis, playing with musicians on Beale Street and in Handy Park. Here he met Little Buddy Doyle and Honeyboy Edwards, Will Shade and Willie Tango. Through a pianist known as M&O he met Robert Johnson. The two bluesmen hit it off and in late 1935 started travelling together. Johnny was now an itinerant musician, travelling with Johnson widely, up to St.Louis and from Texas to Tennessee and may points inbetween. Over the coming years Johnny and Robert would hook up and travel to Canada, New York and Chicago. This friendship was broken when Johnson met his fate in a Greenwood jukejoint in August 1938. Johnny settled in Chicago and played the clubs. In 1946 he made his first recordings for Columbia but unfortunatly they were never released. He recorded again in 1950 for Chess but was less than pleased when they referred to him with the derogatory "Shoe Shine Johnny". 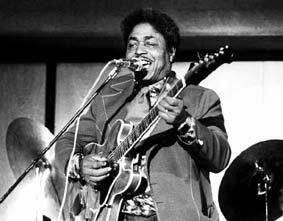 In the 50`s Johnny recorded 2 sessions for Joe Brown`s J.O.B. Label, the first produced Ramblin` and Cool Driver. By the late 50`s Johnny could not get a recording contract, so he again went back to day work. In 1965 Johnny was located by researcher Mike Rowe in Chicago, and persuaded to record a session for Vanguard. This lead to other recordings and even a cameo in a film, but as with Leadbelly before him, he found it hard to get beyond what was his core audience. Concert, festival appearances and overseas tours followed as well as several solo albums. Sadly a stroke in 1980 curtailed his activities although he still managed to tour as a singer and record a well recieved swansong album. Johnny`s health got progressively worse and he died just before his 77th birthday in April 1992. The recordings on this Document CD are from 3 nights that Johnny played at Jazzland. The songs exemplify Johnny`s vocal range and lyric invention as he touches on the sad themes of loneliness, illness, aging and mortality. Like Big Boy Crudup, in standard tuning Johnny was a functional guitarist good but not flashy, but when using a slide he overwhelmed the listener with his playing. Bob Groom in the cd sleeve notes says of Johnny: "The sheer power, dynamic range and emotional intensity of Johnny`s music must put him in the top rank of blues vocalists. I once dubbed him the male equivalent of Memphis Minnie and he was flattered, certainly not offended, by the comparison." In addition to performances of some of Johnny Shine`s classic commercial recordings and covers of well known Robert Johnson recordings this album boasts hitherto unrecorded numbers by Shines himself. This recording extends our appreciation of his talents as a performer and recording artist, putting him amongst the very greatest blues artists of all time. This is the first time that these recordings have been released and come with extensive booklet notes written by Bob Groom and full discographical details. As a perfect accompaniment to the new Document release of Johnny Shines live (DOCD-32-20-7), we would like to bring to attention a previous Document release by Mr. Shines and others. 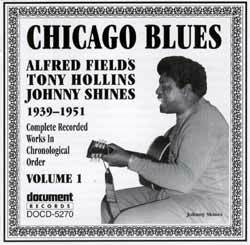 Chicago Blues (DOCD-5270) is a compilation featuring Alfred Fields, Tony Hollins and Johnny Shines and the sessions they recorded between 1939-1951.